The Feelz Good™ Massaging Hair Brush is a compact and portable hairbrush with built-in massage technology that helps to give your hair a thicker, fuller appearance. Using the massage mode while brushing your hair generates charged ions that help detangle your hair and give it a thicker, fuller appearance. 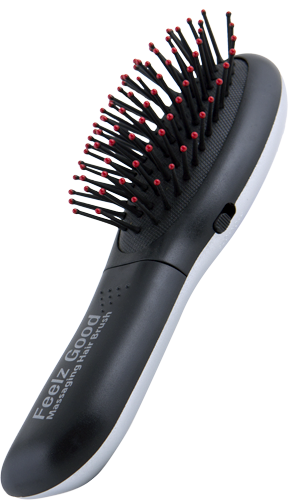 If you find yourself stressed and need a quick, relaxing massage, or if you simply wish to give your hair a thicker, fuller appearance, the Feelz Good™ Massaging Hair Brush is perfect for you.